The town was built in 1703, on the left of the River Asinaro, 6 km SE of Noto Antica, which was destroyed by the earthquake in 1693. In classica1 times it was a Greek centre a Roman colony. During the Arab dornination it became the capital of the Val di Noto. After the exodus of the population and the tremendous econornic crisis following the earthquake in 1693, the town was rebuilt in accordance with originai town-planning criteria, and began once again to prosper emographically, cu1turally and econornically. However its role as the main urban centre in the valley passed to Syracuse in 1817. Since World War II there has been a gradual abandonment of the old town centre, with the creation of new quarters S of the town. Entering Noto from the E, by way of Porta Reale, we follow Corso Vittorio Emanuele, along which we can admire numerous 18th c. buildings of great architectural value, e.g. the Chiesa di San Francesco, with the former Convento dei Francescani and the Monastero Benedettino del Salvatore, wih its elegant late baroque architectural features. Also in Corso Vittorio Emanuele, at No. 134, is the Museo Cìvico. This Museum boasts sculptures by Gian Domenico Gagini, objets d’art oft he 15th c. and various archaeological items of the prehistoric, Greek and Roman periods. Passing the former Monastery of the Benedictine nuns, which houses the contemporary art section of the Museo Cìvico, we come to the Chiesa di Santa Chiara, where there is a precious Madonna by Antonello Gagini, and eventually reach Palazzo Ducezio, now the Town Hall. This palace was designed by Vincenzo Sinagra with an original arcade; the interior has neoclassical-style frescoes by Antonio Mazza. Opposite Palazzo Ducezio is the scenographic square dominated by the Duomo, dedicated to St Nicholas of Mira, from the top of a broad three- ramp stairway. Into a nave and two aisles: the beauty of its architecture. the sumptuous marble altars. the recently added frescoes, and a 16th c. silver um with the relics of St Corrado Confalonieri, Noto’s patron saint. On 13 march 1996, the dome with the aisles fell down. The square is completed and further enriched by the 19th c. Archbishop’s Palace, the Chiesa and Monastero del Salvatore, and the 18th c. Palazzo Landolina. A street to the left of the square leads to the 17th c. Palazzo Nicolaci Villadorata, now used as the Town Library , and celebrated for the stupendous grotesque stone-carved figures supporting its elegant baroque ba1conies. Returning to Corso Vittorio we immediately come to the Chiesa del Collegio, dedicated to St Charles, next to which is Piazza XXIV Maggio, with the Chiesa di San Domenico and its convex honey-coloured tufa facade and the former Dominican Convent. The interior of the church is centrally planned and there are five cupolas dec- orated in rococo style. Corso Vittorio Emanuele ends at the 19th c. Teatro Comunale and the 18th c. Chiesa di San Michele. Climbing towards the upper part of the town through the Arabic-type lanes, we come to Via Cavour, with its baroque churches and pa1aces and their lovely facades. C1imbing stilI further, by way of Via Sallicano (more baroque buildings with elegant facades), we reach Piazza Mazzini. This is where the Chiesa del Crocifisso stands, with its sumptuous central porta1. The church contains, among stuccos and paintings, the Madonna della Neve (Madonna of the Snow), a prestigious work by Francesco Laurana. Excursions: to the archaeological zone of Eloro (Helorus) and Noto antica, ruins of the town destroyed by the earthquake in 1693. 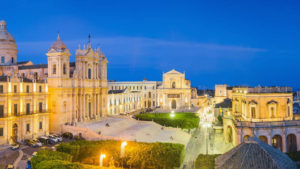 This compelled its inhabitants to found the modem town of Noto some 6 km to the S, which, inspired by a unitary conception, constitutes a veritable jewel of baroque art.